'Extraordinary Rendition' brought together video, sculpture, audio, photography, painting and drawing by nine international artists in response to notions of risk, frictionlessness and its representation. Following a pre-modern discourse of danger, the emergence of risk – alongside the invention of insurance – proposed a world governed by immaterial markets that were no longer regulated by order, but by fundamental uncertainty, threat and insecurity. For its contextual backdrop, this exhibition attempted to think of the present as a cultural mythology through manifestations and elaborations of this principle. One could cite the orchestration of illusory energy and finance markets, the manipulation of governance and property, or the clandestine rendition of terror suspects. (Correspondingly, the Enron scandal, corruption uncovered by operation Malaya in Marbella, or CIA stop-offs in Palma de Mallorca, for example.) Furthermore, there are the unpredictable mega-weather events or reckless insurgencies that are also symptomatic of an ever more stochastic and violent reality which similarly escapes an ordinary logic of probabilities or worth. Social sensitivity to issues of security are rapidly changing our society. Alongside this global picture, our everyday lives – especially with respect to children – are increasingly subject to a suffocating psychology of risk aversion. Mariana Castillo Deball is concerned with the mechanisms of classification and the way facts, history and culture are written, archived, ordered and distributed. 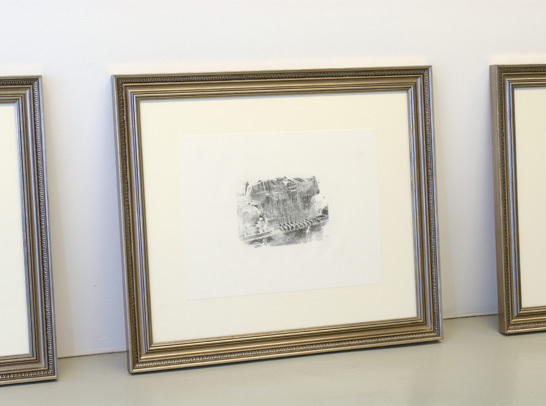 In the installation 'It rises or falls...' (2006) she revisited a popular legend around the looting and transportation of the colossal stone statue of Tláloc to the National Museum of Anthropology in Mexico City in a series of lithographs. These were presented in parallel with a selection of audio interviews with antique dealers in Amsterdam, and in Barcelona, who discussed their profession's role in the creation of value, and the uncertainties of the market. Also presented here was her parasitical edition of the sport section of The Guardian newspaper from 2003, which includes an interview with the footballer Gianni Buffon about goalkeeping, chance and play. Gardar Eide Einarsson works include bleak paintings, iconoclastic wall texts, as well as hermetic sculptures and photographs. Setting up austere encryptions of 'scenes' and subcultures, such as skateboarding, graffiti, tattooing and punk rock, the artist's practice is a precarious questioning of what is excluded and what can be delimited as a consumable in culture. 'We'll Make The World You Live' (2005) was shown in ‘Extraordinary Rendition’. 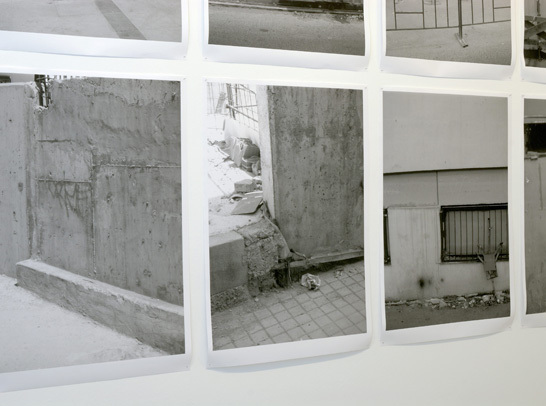 It consisted of cheaply printed photographs pinned to the wall – depicting improvised barriers, security blockades and urban obstructions that appeared on the streets of Istanbul in the wake of the November 2003 terrorist bombings. Deceptively unexceptional and obstinate, the photographs processed a theatre of violence with global infamy in relation to its municipal reality and its everyday aesthetic. 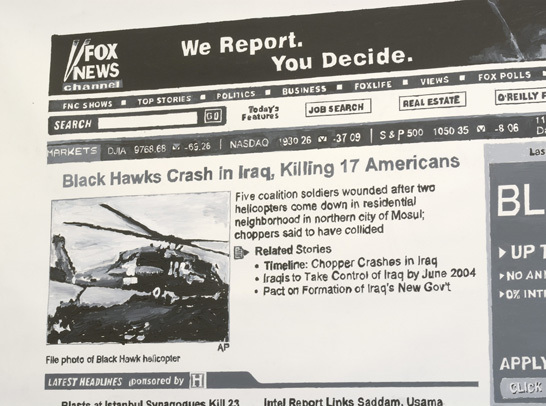 Rainer Ganahl’s 'News Paintings' such as 'FOX NEWS, 11/14/03, Black Hawks Crash in Iraq, Killing 17 Americans' (2003) attempt to freeze the relentless flow of the instantaneous yet immediately old information offered by the internet. These excessively enlarged paint-on-canvas versions of web browser windows depict sites such as Yahoo! news, Fox News or CNN as they reported breaking news stories. Amid the overload of other headlines, advertising banners, stock market alerts, corporate logos and other graphical elements on the page, the construction of history and memory is examined as an abstracted mechanism of ideological composition. As the artist has written of his role in this age of 'infotainment', "when it once might have been accurate to paint battlefields for kings of winning armies, as a quasi-voiceless consumer of news, it now appears correct for me to paint these web pages ...[where] news is news independent of the gravity of its content: dead body counts or 'best dresses' at the Oscars". Carsten Höller's best known artworks often set up disorientating experiences, and repeatable surprises involving flying machines, hallucinogenic mushrooms, spiraling slides and mirrored carousels. 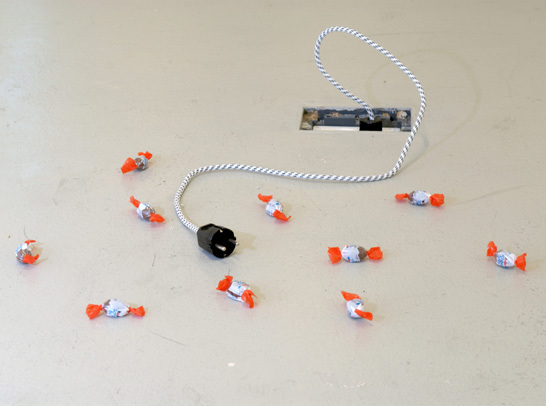 Comprised of a potentially lethal electrical wire baited with chocolate treats, '220 Volt' (1992) is part of an early body of works centred around devices for causing infant mortality: a kid's garden swing that is bolted onto the edge of a thirteenth-floor roof ('Hard, Hard to be a baby',1992), the explosive 'Bicycle Bomb' (1992), or a baby bottle filled with venomous frogs, for example. Beneath the cartoonish violence of Höller's 'Killing Children' works lay a questioning of the exceptional status held by the very young in our increasingly risk-averse societies, and the particular abhorrence and moral panic reserved for the exploitation of the vulnerable. Christopher Knowles’s paintings, opera librettos with Robert Wilson and 'typings' are hypersensitive to both the colour and physicality of language. Diagnosed as autistic as a child, Knowles continues to examine the capricious nature of hierarchies as his work has become increasingly satirical. 'Untitled (Alert Paintings)' (2004), a single part of which was included in this show, served as a reminder of how pop logic can also service political power. Depicting the US Department of Homeland Security’s Threat Advisory System, with its notorious colour-coded levels ascending from ‘Low’ (green) to ‘Severe’ (red), the artist visualized this attempt to quantify and package the threat of terrorism as an exercise in hysterical abstraction. Knowles' unique understanding of visual grammar finds its climax in this indictment of the Bush administration’s management of fear and risk under the farcical banner of a candy-coloured chart. Josephine Meckseper’s films, photographs and installations crackle with ideological friction. Using shelves, wallpaper, broken mirrors, vitrines and shop fittings, arranged with evocations of revolution, protest and product – a chromed hammer and sickle, a stockinged mannequin leg, ostrich feathers, a shrink-wrapped toilet brush, etc.– she explores the consumption of political unrest seen through fashion and advertising. 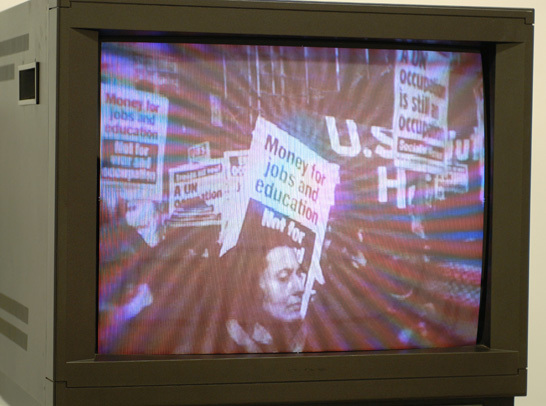 Her film 'Rest in Peace' (2004) includes Super-8 footage shot by the artist at the September 2005 rally in Washington against the war in Iraq (as well as those in New York and Berlin) intercut with historical footage of antiwar demonstrations. By accumulating and manufacturing evidence of nostalgia for the 'look' of protest, Meckseper suggested that today's demonstrative forms of political expression risk being empty reproductions of a radical chic, that are easily devoured and neutralised by the media. The works of Roman Ondák are restrained, gently humorous and often barely distinguishable disruptions of social norms and everyday experiences. 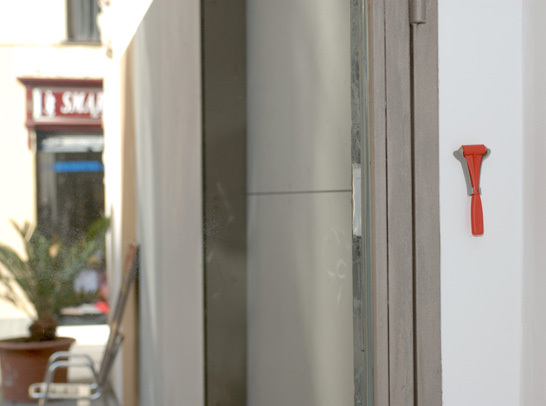 He has set up situations of displacement that might only be noticed over time, such as when he parked several old Skoda cars with Slovak license plates behind a museum in Vienna for two months ('SK Parking', 2001), or possibilities for inexplicable encounters that generated speculation, such as 'Good Feelings in Good Times' (2003), an 'artificial queue' of people that formed and dispersed without calling any attention to itself as an artistic performance. 'Untitled (Traffic)' (2001) was originally conceived for various premises in Slavonski Brod, Croatia. 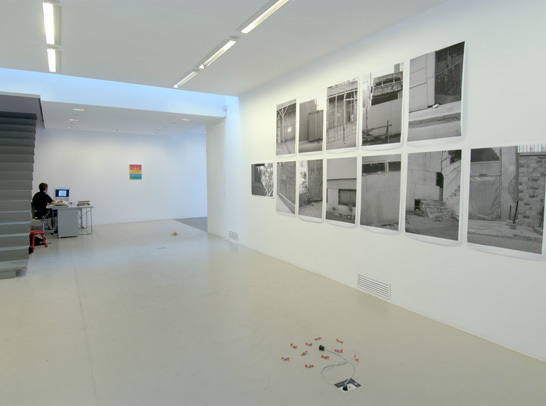 It consisted of the siting of emergency exit hammers, such as those installed in – or often stolen from – public buses, in locations adjacent to the gallery windows and the windows of other nearby businesses, incrementally altering our perception of the implied threat posed by these interiors. Wilfredo Prieto often pursues an ironic strategy of what seems to be staged futility and 'much ado about nothing'. Though similarly filtered through a sense of the absurd, other pieces have required contrastingly grand maneuvers, such as a telescopic crane that attempted to lift up itself ('Crane', 2006). The apparent self-cancellation of this sculpture was also evoked in 'White Library' (2004) where shelves with 6000 blanks books tell no stories, show no images and display no knowledge, or 'Apolitical' (2001), in which flagpoles fly national flags in shades of grey, as if they've been bleached of meaning by exposure to the sun. 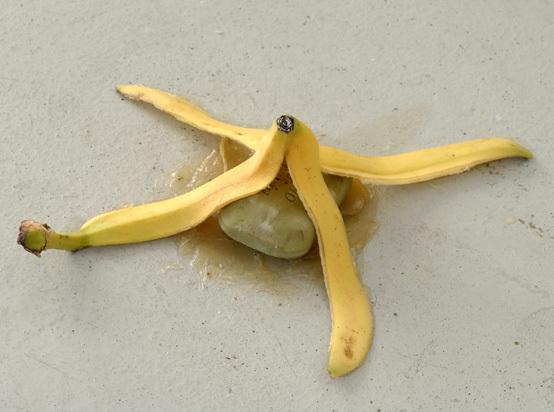 Shown originally in the middle of a large room at the Santa Clara Convent in Havana, the work presented in this exhibition – 'Grease, Soap and Banana' (2006) – was a shorthand for a potentially frictionless moment, a slippery and 'thoughtless' artistic statement. The practice of Natascha Sadr Haghighian has taken the form of videos, actions, animations and sound installation and is often concerned with the dilemma of visibility and authenticity. Her work questions the strategies of empowerment in accepted and authoritative representational structures. Her ongoing 'Bioswap' project, for example, seeks to deliberately confuse the notion of how biographies are used to justify who is regarded as a significant artist. The short video 'Embargo Embargo' (2003) referred to biography with a more geopolitical slant. According to the copyright specifications for Adobe software, it is illegal to download Photoshop in 'failed states' such as Cuba, Syria, Iran and Sudan, and any citizen of these countries is automatically barred from using them. 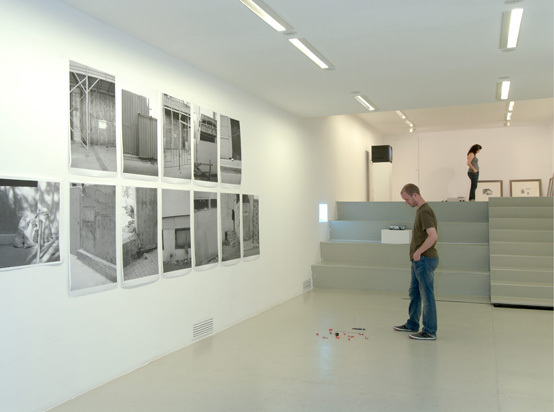 'Elsewhere 3' (2005–7) was an experience-oriented work and an intervention into the exhibition's soundscape where it seems as if someone is trying to break through the wall, an absence and a presence at the same time. We thank the collaboration of all the participating artists; Galeria Abbas (formerly Kunstbuero), Vienna; Esther Schipper, Berlin; Galerie Martin Janda, Vienna; Gavin Brown Enterprise, New York; Galerie Reinhard Hauff, Stuttgart; Johann König, Berin; Team (Gallery, inc.), New York. Artistas: Mariana Castillo Deball (MX/DE), Gardar Eide Einarsson (NO/US), Rainer Ganahl (AT/US), Carsten Höller (BE/SE), Christopher Knowles (US), Josephine Meckseper (DE/US), Roman Ondák (SK/DE), Wilfredo Prieto (CU) y Natascha Sadr Haghighian (DE). 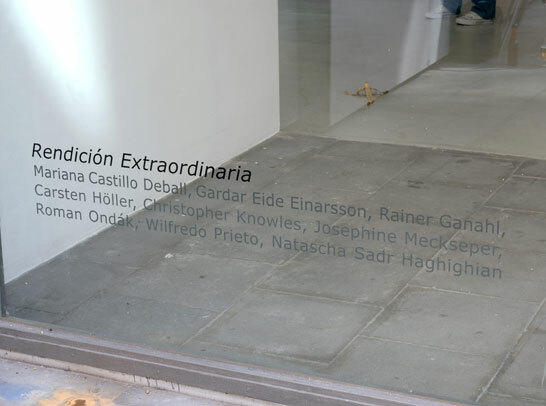 Rendición Extraordinaria reunió la obra de nueve artistas internacionales cuya obra reflexiona entorno al riesgo y su representación visual mediante vídeo, escultura, audio, fotografía, pintura y dibujo. Entorno al discurso pre-moderno entorno al peligro y la emergencia del riesgo – junto con la invención de los seguros – se propuso un mundo gobernado por mercados inmateriales, no regulados por el orden sino fundamentalmente por la incertidumbre, la amenaza y la inseguridad. Con este telón de fondo, la exposición intentó analizar el presente como una mitología cultural a través de manifestaciones y elaboraciones de este principio. Se podría mencionar la instrumentalización de los mercados financieros, la ilegal manipulación de propiedades y terrenos o la clandestina rendición de terroristas sospechosos – el escándalo financiero de Enron, la desmantelada corrupción de la operación Malaya en Marbella o las breves escalas de los aviones de la CIA en Palma de Mallorca, respectivamente. A esto se unirían los desastres climáticos de impensable envergadura o las insurrecciones temerarias, sintomáticas de una realidad aún más estocástica y violenta que de modo similar escapa a la lógica de la probabilidad o de lo merecedor. La sensibilidad social a temas de seguridad está también cambiando enormemente nuestra sociedad. En este panorama global nuestra vida diaria, especialmente en relación a la protección de la infancia, es sujeto constante de una psicología de aversión al riesgo. Mariana Castillo Deball se interesa por los mecanismos de clasificación, la manera en que los sucesos, la historia y la cultura se escriben, se archivan, se ordenan y se distribuyen. En la instalación 'It rises or falls...' (2006) Castillo Deball revisó la leyenda popular entorno al robo y transporte de la estatua colosal del Tláloc al Museo Nacional de Antropología de México DF en una serie de litografías. Éstas se presentan en paralelo a una selección de entrevistas de audio a marchantes de anticuarios de Amsterdam y en Barcelona, que discuten el rol de su profesión en la creación de valor y las incertidumbres del mercado. También se presentó su edición ‘parasítica’ de la sección de deportes en el periódico The Guardian del 2003, en la que se incluye una entrevista con el futbolista Gianni Buffon entorno a lo que implica ser portero, el azar y el juego. La obra de Gardar Eide Einarsson incluye lúgubres pinturas, textos iconoclastas sobre pared, esculturas y herméticas fotografías. 'We'll Make The World You Live', (2005) incluídas en ‘Rendición Extraordinaria’ – impresiones de bajo coste sobre papel colgadas en la pared – documentaban barreras improvisadas, bloqueos de seguridad y obstrucciones urbanas que aparecen en las calles de Estambul después de los ataques terroristas en Noviembre 2003. Decepcionantemente ordinarias y obstinadas, las imágenes procesan un teatro de violencia de infamia global en relación con su realidad municipal y su estética de la vida cotidiana. Las News Paintings de Rainer Ganahl como 'FOX NEWS, 11/14/03, Black Hawks Crash in Iraq, Killing 17 Americans' (2003) intentan congelar el incesante flujo de las informaciones instantáneas y automáticamente obsoletas que se ofrecen continuamente en internet. Las obras presentan excesivamente ampliadas versiones del buscador, mostrando ‘pantallazos’ de portales como Yahoo! news, Fox News o la CNN relatando noticias de última hora. En medio de la saturación de rótulos publicitarios, alertas de la bolsa, logos corporativos y otros elementos gráficos, Ganahl examina la construcción de la historia y la memoria como un mecanismo abstracto de composición ideológica. El artista ha descrito su rol de la presente era de 'infotenimiento', como “una época en la que parece que lo correcto es pintar esas páginas web... [donde] las notícias son notícias independientemente de la gravedad de su contenido: ya sean recuentos de muertos o los mejores vestidos de los Oscars". Las obras de Carsten Höller son conocidas por crear experiencias que desorientan al espectador a través de máquinas voladoras, hongos alucinógenos, rampas espirales y carruseles con espejos. A pesar de ello, desde mediados de los 80, su aproximación experimental ha producido numerosas y deliberadamente inconclusas investigaciones sobre temas tales como la duda y la incertidumbre, el amor y la felicidad, la seguridad y la infancia. Compuesto de un cable eléctrico potencialmente letal que actúa de cebo con chocolates Kinder, '220 Volt' (1992) forma parte de una serie de trabajos centrados entorno a artefactos creados para provocar la mortandad infantil: un columpio anclado en el techo de un edificio de trece plantas ('Hard, Hard to be a baby', 1992), la explosiva 'Bicycle Bomb' (1992), o un biberón lleno de ranas venenosas, por ejemplo. Bajo la aparente violencia de dibujo animado de la serie 'Matando a Niños' existe una interrogación sobre el estado excepcional adquirido por los más pequeños en una sociedad cada vez más adversa al riesgo, y en particular la repugnancia y el pánico moral entorno a la explotación de los más vulnerables. Las pinturas, libretos de ópera junto a Robert Wilson y los trabajos mecanografiados de Christopher Knowles son hipersensibles al color y a la fisicalidad del lenguaje. En sus obras mecanografiadas sobre papel, de los 70 y 80, Knowles adapta comúnmente el sistema de las listas de éxitos o arregla cartas y puntuaciones convirtiéndolas en pictogramas. Diagnosticado un tipo de autismo de pequeño, Knowles continúa examinando la caprichosa naturaleza de las jerarquías al tiempo que su trabajo aumenta de tono satírico. 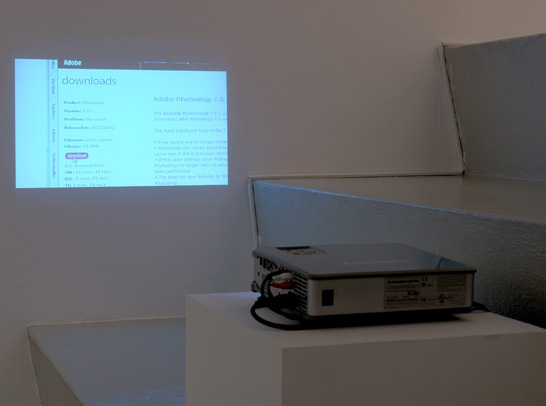 'Untitled (Alert Paintings)' (2004), de la cual se incluye una única parte en esta exposición, sirve como recordatorio de cómo la lógica cromática puede estar al servicio del poder político. Representando el sistema de alerta implementado por el de Seguridad Nacional de los Estados Unidos, con su notorio código de colores y niveles –ascendiendo de 'Low' (bajo y en verde) a 'Severe' (Alto y en rojo)– el artista visualizó este intento de cuantificar y 'empaquetar' la amenaza del terrorismo como un ejercicio de abstracción histérica. Su peculiar entendimiento de la gramática visual encuentra el clímax en esta acusación a la administración de Bush, por manejar el miedo y el riesgo bajo la pancarta absurda de colores acaramelados que parecen sacados de una lista de éxitos. Las películas, fotografías e instalaciones de Josephine Meckseper provocan fricción ideológica. Mediante estanterías, superfícies empapeladas, espejos rotos, vitrinas y mobiliario de tiendas dispuestos evocando revolución, protesta y producción – un martillo cromado y una hoz, la pierna de un maniquí con una media, plumas de avestruz, un cepillo de wáter envuelto, etc.– Meckseper explora el consumo de disturbios políticos vistos a través de la moda y la publicidad. Su película 'Rest in Peace' (2004) incluye material en Super-8 filmado por la artista en una concentración contra la guerra de Iraq en Washington en Septiembre 2005 (como las que hubieron en Nueva York y Berlin) intercalado con material histórico de varias manifestaciones contra guerras. Acumulando y manufacturando evidencia hacia la nostalgia del 'look' de protesta, Meckseper sugiere que las formas actuales de expresar inconformismo político arriesgan convertirse en reproducciones vacías con un tinte 'radical chic', fácilmente devoradas y neutralizadas por los media. Las obras de Roman Ondák son cohibidas y levemente cómicas. A menudo difícilmente se distinguen de las disrupciones de las normas sociales o de experiencias diarias. Ondák ha orquestrado situaciones de desplazamiento perceptibles únicamente a través del tiempo, como cuando aparcó varios coches Skoda con matrículas eslavas atrás de un museo en Viena durante dos meses ('SK parking', 2001), o posibilidades para encuentros inexplicables que generaron especulación, tales como 'Good Feelings in Good Times' (2003), una cola 'artificial' de gente formada y dispersada sin previo aviso y sin ser considerada una performance artística. 'Untitled (Traffic)' (2001) fue originalmente concebido para varios establecimientos en Slavonski Brod, Croacia. Consistió en situar martillos de emergencia, como los instalados en – o a menudo robados – autobuses públicos, en lugares adyacentes a las ventanas de la galería y en las ventanas de los comercios cercanos que gradualmente alteran nuestra percepción sobre la amenaza sugerida por sus interiores. Wilfredo Prieto a menudo sigue la estrategia irónica de escenificar la inutilidad y el 'mucho ruido y pocas nueces'. También filtradas a través de lo absurdo, sus otras piezas han requerido maniobras de gran contraste, tales como una grúa telescópica que intenta levantarse a sí misma ('Grúa', 2006). La aparente auto-cancelación de la escultura se evoca también en 'Bibliotecas Blancas' (2004) donde las estanterías contienen 6000 libros en blanco sin historias, sin imágenes y sin conocimiento alguno, o 'Apolítico' (2001), donde banderas de varios países ondean en tonos de gris como si hubieran sido descoloridas de significado al ser expuestas al sol. Mostrada originalmente en una gran habitación del Convento de Santa Clara en La Habana, la obra presentada aquí – 'Grasa, Jabón y Plátano' (2006) – es un esquema para un posible instante sin fricción, una declaración artística resbalosa y desconsiderada. El trabajo de Natascha Sadr Haghighian se manifiesta a través de vídeos, acciones, animaciones e instalaciones sonoras y a menudo se centra en el dilema de la visibilidad y de la autenticidad. Su trabajo cuestiona las estrategias de atribución de poder de las estructuras aceptadas por todos. Su video 'Embargo Embargo' (2003) analiza la parte geopolítica implicada en las biografías. De acuerdo con los derechos de uso del programa de Adobe, es ilegal descargar Photoshop en 'estados fallidos' tales com Cuba, Siria, Iran y Sudan, y a cualquier ciudadano de esos países le está terminantemente prohibido usarlo. 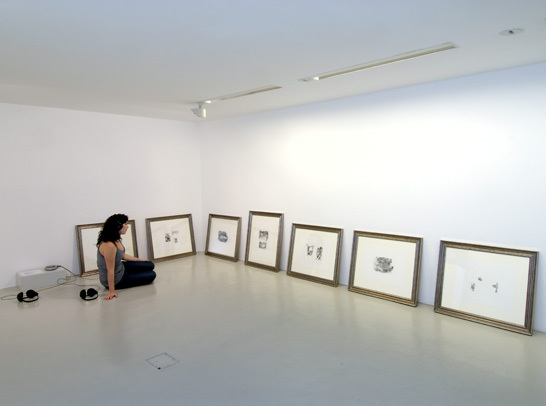 'Elsewhere 3' (2005/7) es una pieza pensada para la experiencia, una intervención en el espacio sonoro donde parece que alguien esté intentando forzar su entrada a través de la pared, ausente y presente al mismo tiempo. Agradecemos la colaboración de los artistas participantes así como a la Galeria Abbas (Kunstbuero), Viena; Esther Schipper, Berlin; Galerie Martin Janda, Viena; Gavin Brown Enterprise, Nueva York; Galerie Reinhard Hauff, Stuttgart; Johann König, Berin; Team (Gallery, inc.), Nueva York.